We’ve all heard stress is killing us, that we need to find new ways of dealing with it, and that meditation is one of the best ways of doing that. But, what do I do? Just sit there? Ok, and do what? Well if you’re struggling with what meditation is and exactly how it can help you keep your cool and relieve stress, first check out my article Best Meditation Techniques – Freelance Destress Edition and then come back here. If you have a basic idea of how meditation works and its benefits then let’s check out my Calm App Review and see what it’s all about. When you first open the app, whether, on your smartphone or tablet, you’ll get a screen that looks like this. I think it’s quite possibly the best way for a meditation app to open. That small reminder for you to take a deep breath puts in the mindset of focusing on the present and gets you ready for the session ahead. 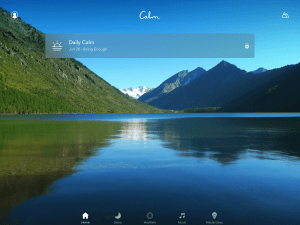 Now, the calm app homepage might be one of my favorite parts of the whole app. You can choose between a few different home screens just by swiping left or right and you can find a ton of different ambience options that include: snow-covered tree, rainforest, fire, or calming lake with bird sounds. Personally, I went with the lake option as it reminds me of a place I used to go with childhood friends and just thinking about it puts a smile on my face. The first icon you see on the bottom left is the sleep icon. 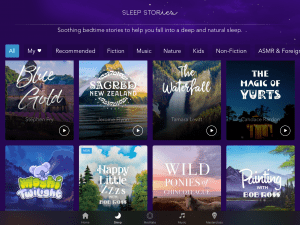 If you’re someone who’s mind races at night and you just can’t seem to relax I think these sleep stories would be perfect for you. Some are free, but most are paid, You can choose anything from Bob Ross talking to you to Wisdom of the Jungle. They’re designed to help you focus on one thing, and they’re very calming and quiet, and nothing too exciting that get’s your blood churning. They also automatically turn off your device and the sound when they’re done so you don’t have to. In my opinion, there are many different ways for people to find calming, meditation-type music (like youtube). However, if you were on the go and didn’t want to use up data, this option could come in handy. 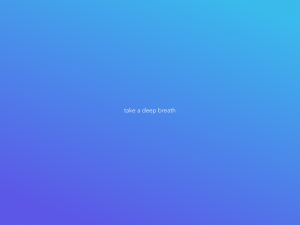 It would be great for self-guided meditations or just a way to block out background noise if you’re in a busy public place and would like to get in a little time for some mindfulness. This option, for me, is the most used. I don’t really feel the need to have music or story to sleep as I’m usually snoring in about 4 and a half seconds. I think that partly has to do with the meditation practice and the fact I have a list of everything I need to do the next day written down, so I don’t continually dwell over it laying in bed. Anyways, when you first click on the meditation option, it takes you to the screen above. What I like about the Calm app and something many meditation apps don’t have, are the categories on the top. You can choose between Stress, Sleep, Beginners, Emotions, etc. It makes it very clear and straightforward for users to decide on exactly what they want to work on at that time. However, sometimes Calm does cheat a bit and use the same recorded sessions in a few categories, but honestly, there’s a lot of cross-over between many of them. It will also help you direct your meditation to an individual goal and the outcome you’re looking for. 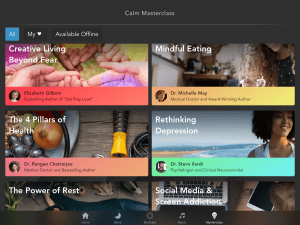 Calm also has different series of recordings such as “7 days of calm” and anxiety, “7 days of managing stress”, or “7 days of sleep”. I’m a big fan of this idea because 7 days is a very manageable period for most people. When you start talking about more than a week or even a few weeks, many people can’t wrap their head around that, so they don’t even start. Another thing that sets the Calm App apart from most meditation apps is that during your session, the moderator tells you exactly why you’re doing what you’re doing. They remind you why and how mindfulness meditation can benefit you in your daily life. At the end of most sessions, there is a short minute or two explanation and overview of what you’ve worked on and the reason behind it. I think many people don’t remember the benefits of meditation, so they don’t make it a habit and continue practicing. Calm app reminds you at the end of each session about the benefits and how you can integrate it into your daily life. The Daily Calm Highlights section is a really solid place to start for beginners, and they’re entirely free. You can choose between some of their most popular recordings by category and Calm will automatically start a session for you. If you’d like to work on gratitude or letting go, you just click on the topic and choose a recording. Calm app meditation right now! If you’re interested in the daily calm series or exactly what they offer. I’ve included a meditation from the app they posted on their YouTube page. Her voice is incredibly soothing and actually trying it out might be your best bet. Most apps use push notification now and I really just don’t like them. However, for habit-creating apps, like Calm, I think this is something that most people need to keep going long enough to see results. Meditating for one day is like going to the gym once, you’ll be lost and distracted most of the time and won’t really get anything out of it. To see any sort of results from meditation, many of us will need a daily reminder to be mindful, and I think the push notifications come in handy for that. This section is basically a set of lectures by some well-known Doctors or authors talking about different topics and how meditation can improve your life in different contexts. There are talks like Rethinking Depression, Social Media & Screen addiction and Mindful Eating. If you’ve ever heard of TedTalks, the Masterclasses reminded me a bit like that but without the visual aspect. Like a podcast. This obviously is a display of how Calm wants to educate it users and wants them to understand why meditation is important. If you’re a beginner and don’t quite have the rhythm of your breathing yet, the Breathe Bubble is perfect for you. You can customize to take 4, 6 or 8 breaths per minute. I would highly recommend the 6 breaths for beginners as that’s a 5 second inhale and 5 second exhale. If you feel like it’s too short than by all means, use the 4 breaths per minute. I actually prefer it. As you can see above, the bubble expands when you breathe in and shrinks when you breathe out. They’ve also added a noise that is different on the breathe in and breathe out parts. Some people say they don’t like the bubble because it takes the focus away from your body but if you’re having trouble listening to your body and finding a breathing rhythm, I would highly recommend trying it out. If you’d rather watch a video representation of what you can get in the calm app, this calm app review from Marking Progress does a solid job of showing you in real time what you get with the calm app. The only real con for me with this app is that most of the sessions are at least 10 minutes. I believe 10 minutes is a great average time for meditating in our busy lives. However, it may be a bit much for some who only have 5 minutes to spare some days and a bit short for those who would like longer sessions. There is a timed session option but they basically just have longer pauses in between instructions the longer you meditate for. Really other than that I can’t find anything else wrong in this Calm App Review. 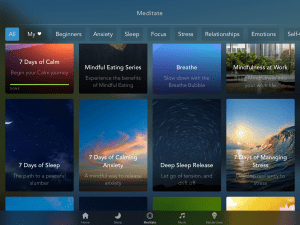 Calm App Review – Should I upgrade? There is quite a bit on offer in the free version and to start out with, I’d say stick with the 7-day free trial. You’ll have to put in your info and say you’ll buy the year subscription but it can easily be cancelled in the subscription part of your device. However, a year subscription will only run you $59.99, about $0.16 per day for all the guided meditations you could ever want. If you enjoy the 7-day trial than definitely think about the upgrade. Making meditation a part of your daily routines will help not only your freelance business but also your overall well-being, relationships and stress level. 0.16 cents per day is a pretty small price to pay for those kinds of results. I’ve run you through what the Calm App offers and my recommendation for where you should start if you’re a beginner and what I like and dislike about it. That being said, I hope you’ve enjoyed my Calm App Review. I really enjoy this app, and it’s a part of my morning ritual right after my coffee, and I check the news. It has helped make meditating a habit in my life, and I have no doubt it can do the same for you. You can check it out for yourself at Calm.com. Do you agree with my calm app review? Leave me a comment below. Hey thanks for this article! Meditation is definitely something I’ve been meaning to work on for a while now, but unfortunately haven’t gotten around to yet. This app looks great, but it’s a shame to see it requires payment. The services definitely look worth it, but what advantages does it have over the free apps that have very similar possibilities? Hey, I understand that paying for it might seem like a nuisance but as I broke down in the article we’re talking about $0.16 a day and for the content that you receive, it really is worth it. The advantage is that this app has more guided meditations, they’re broken down into many different categories, they have masterclasses, a breath bubble for beginners, an option for music and stories to help you fall asleep. There is no other app out there with such a wide array of options all in one place. I know many use headspace but I’d easily put Calm in the top spot of meditations apps out there. Thank you for stopping by! In the masterclass section of your post you mention mindful eating. Is this a actual guided meditation in the calm app. I have plenty of friends that may benefit from this. Eating has become a social activity instead of one to replenish our bodies. Mindful eating could help as a reminder and supplement to dieting. The masterclass section is more lectures than actual guided meditation, however it gives you the tools and strategies you can use to be a more mindful eater. You’re absolutely right that eating/drinking are more social than anything else. As was smoking not so long ago. Being mindful, meditating, and making decisions with clear thoughts can all help with overeating or “eating your feelings”. Unfortunately the social aspect can be pretty dangerous as we’re not conscious of what we’re eating or drinking when we’re laughing and having a good time. It’s the same reason they say don’t eat and watch t.v. at the same time. Making eating a subconscious action can do a lot of harm over the long run. Hey there! Thanks for writing this detailed review. I have been looking for a way to commit to meditation and this looks like an excellent option. I was wondering if there were any free features outside of the 7-day free trial? Also what system is it for or will it work for android and iOS (Apple? I always forget the right way to write it). Thank you for stopping by. There are many free features! about 25% of the meditations are free I’d say and for starters that’s more than enough. If you’re looking for something specific though you’ll probably have to pay for a subscription. It’s on both android and iOS. Let me know if you have other questions on the calm app review! Take care! as a person who is constantly stressed out, I am always looking forward to new and effective ways to relief the stress and maintain good mental health. 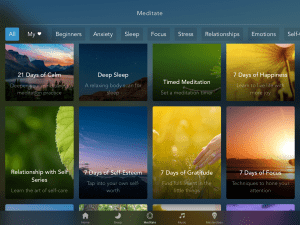 Medidation is something that’s been on my sight for quite some time and finally I have stumbled across some solid medidation app! What stood out for me the most about Calm app, is the variety of content which they have to offer. 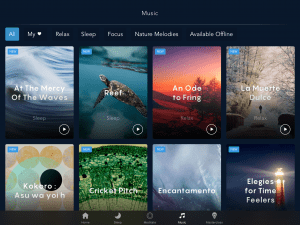 I was very pleased to discover that Calm has different Sleep Stories, Medidation and Music sections which all have many unique content to choose from and enjoy! Great stuff! And 0.16$ a day is pretty good deal in my eyes! Thanks for such informative and helpful review, keep up the good work! I’m glad you’ve decided to start on your meditation journey. It really does help you to lead a more centered lifestyle. If you ever have any questions on this calm app review or meditation in general please don’t hesitate to ask! Well well here we are thank you for bringing the calm app for meditation. Indeed meditation really does work wonderful for everyone in any angle to relieve stress and I agree with your app the first thing you have chosen is the lake for it represent the state of mind in relaxation furthermore to calm oneself in good thinking There are talks like Rethinking Depression, Social Media & Screen addiction and Mindful Eating.is of course, is a display of how Calm wants to educate it users and wants them to understand why meditation is important.. Thank you for stopping by and I’m glad you enjoyed the calm app review. Calm does a great job of informing and educating its users the importance of meditating and I think it’s one of the reasons it’s such a good tool. Thanks for your comment! This was an amazing review, I have downloaded this app recently and never regretted downloading this app, as I find it very helpful as it helps me helps me to meditate and tracks it, and also I like the calming background noises that guides me closer to enlightenment. They have Tons of meditations programs and they update all time. I’m glad you enjoyed my calm app review! It really is a great program and I have no complaints either. Thank you for stopping by and Happy meditating! Thanks for your informative and useful review on the Calm App. It is timely article for me. I have been looking for mediation techniques for a while now. This App seems to fit me the best. I am a beginner and the rhythm of my breathing is a challenge. I follow the breathe bubble in your website for a while, which sounds a nice technique. But I do feel it takes the focus from my mind. You also provide other articles, such as Best Meditation Techniques. I bookmarked your website and will learn more from you. Thank you for stopping by and you’re right, the bubble can be a bit distracting but it should help you find a rhythm for your breathing. I do have a few other articles besides this calm app review. Let me know if you ever have any questions! Meditation is a very important aspect of the life of a lot of people as it helps them relax and just let nature sink in. I have never made use of a meditation app and I would have to say that I am really impressed with the way Calm app is set up. This would come in handy for a lot of us that find it difficult to fall asleep. I normally like to play soft music when I fall asleep and also listen to the sound of rainfalls. Does this app have the sound of rain falling? It would be really useful if it does. Anyway, the navigation and the way they were arranged would make a user’s experience great as we would know exactly where to go to in order to access what we are looking for. This would really be of great benefit to me. It seems the free version does not offer as much as the paid version does. Hey! This app does have rain falling and the sounds of the rain forest. Meditation has become a really big part of my day as well. Thank you for stopping by my Calm app review and let me know if you have any questions when you give it a try. Happy meditating! Hey there! Very well written review by the way! I have been practicing daily meditation for approximately 4 and a half years now, and I found that it’s one of the best medicine for my whole body and mind! I remember trying out this app some time ago. Not exactly sure when but at least more than a year ago. I guess I did not give it a fair chance because it’s not in my smartphone anymore. After reading your review and seeing that the only con you found about the app is that “10 minutes” is probably too long for someone in a hurry, I will definitely check it out again. I actually do some 10 minutes “quick sessions” when I don’t have enough time to do a more in-depth meditation, which usually lasts between 20 and 40 minutes, depending how much time I have. So this could be what I have been looking for when I’m in a hurry. Thanks for the great tip. I also have bookmarked your website for further exploration and future references! I’m glad you enjoyed the read of my Calm app review. For those who regularly meditate 10 minutes is definitely a quick session, however, I remember just getting started out and could barely sit for 3 minutes at a time. Good luck with the second go around and happy meditating!